Do you know how much we love Gyoza dumplings? As you know, Gyoza is a Chinese dumpling widely eaten all over the world. What is the difference between Chinese and Japanese? In my opinion, how it cooked. I mean, Chinese dumplings are boiled or steamed. On the other hand, Japanese dumplings are pan-fried. 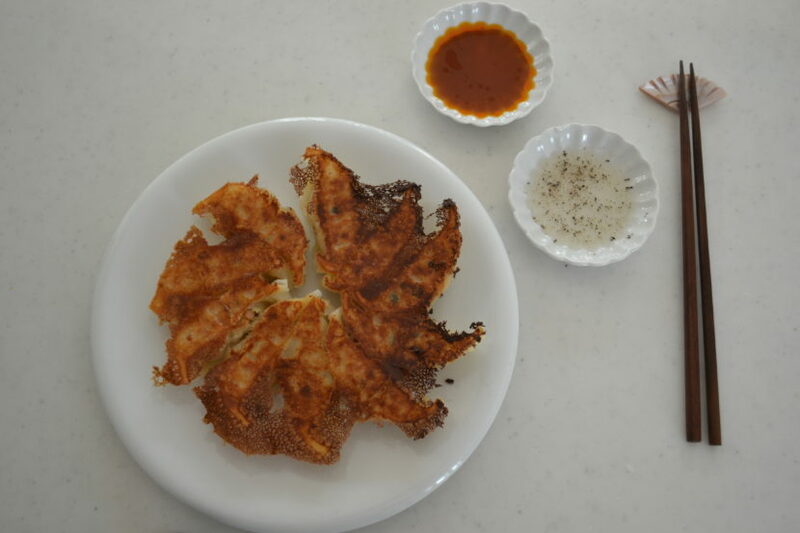 The reason why we like to pan-fry Gyoza is it goes well with rice! The texture of Gyoza is crunchy on the out side, and juicy on the inside. Grab one, dip into vinegary soy sauce, tap onto freshly steamed rice, then eat! Here is a story about Gyoza in my family. Gyoza is spread by a group of people back from Manchuria. My husband’s grand mother was lived in Manchuria for several years in the late 1930s to 1945. Manchuria was ruled by the Japanese government at that time, and her husband was work for South Manchurian Railway company. She had a very good experience while living overseas and learn a lot of Chinese food from locals. She had a first baby girl there, my husband’s mother. When the W.W.Ⅱwas over, they had to go back. While the withdrawal, she delivered a baby boy. I can’t imagine how hard it is. But she was lucky enough to survive all the difficulties. Several years later, her husband and friends started a business which is now known as “Yakult.” It is a very popular lactic acid bacteria beverage. She helped at the factory to fill each grass bottle. Now it is in a plasti bottle, of course. Now they sell “Yakult” more than 10 billion bottles each year all over the world. Sometimes, she made Gyoza for the memories of Manchuria, even after the success. She wrapped her good old days in Gyoza. The story touched me a lot. It is a coincidence, but I have related to Gyoza very much. It has been more than 8 years that I am involved in a Gyoza company. I am developing recipes for them as a consultant. Now I can make better Gyoza than used to be. I wish she could taste it and give me a critical opinion like used to be.Lol. 1. Chop cabbage into 3-5mm pieces in food processor. Sprinkle 1 table spoon of salt and toss to coat. Set aside for 10 minutes or until sweat. 2. Chop garlic chives into same size as cabbage. 3. Put ground pork in a bowl. Add all the seasonings and mix well until the pork fat stick to the surface of the bowl. 4. Add squeezed cabbage and garlic chives into the bowl. Mix thoroughly. 5. Add sesame oil for more flavor. Transfer to a smaller bowl to work easily. 6. And now the fun part! Let’s wrap Gyoza. Dip the half of wrapper in water quickly, to moisten, and put one teaspoonful of filling on the center. Fold in half and make two pleats each side toward the center. Seal tightly. Line them on a tray. In this way, you can save your time and seal more securely. 7. You can freeze the dumpling at this stage. I always store in a resealable container and freeze for later use. 8. Now let’s pan fry. Oil the pan generously before the cook. I like to line dumplings like circle, make sure the bottom of the dumpling oiled. Turn the heat to medium-high, and cook until the bottom gets slightly golden. Pour water to the half way up of the dumpling. Cover and cook for 4 minutes. Uncover, if the dumpling swell, and translucent, it’s almost done. ※The steam from vegetables cook the pork inside the wrapper. When the dumpling swell, it cooked properly. If you didn’t seal tightly, the steam would blown out. Then the juice will overflow and burn. Rotate the pan if there is still some water. When all the water evaporated, run the spatula under the dumpling, cover the dish onto the dumpling and flip. There you have it! Crispy on the outside, and flavorful filling inside, when it is properly fried. If you don’t seal dumpling tightly, the deliciousness from filling overflow from the unsealed part. Gyoza sauce is very simple. One part soy sauce, one part vinegar and a little bit of chili oil. Vinegar and freshly ground black pepper is the latest alternative. Refreshing sour taste is balancing the fatty taste. Give it a try!